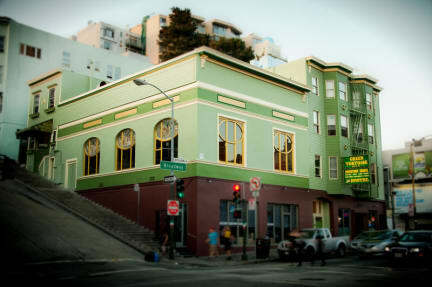 Green Tortoise Hostel v San Francisco, USA: Zarezervujte nyní! Green Tortoise Hostel was definitely my best hostel experience I’ve ever had! I had the chance to meet nice people every day and had so much fun. The location is really convenient with a bunch of fun stuff around. I really appreciated all the free food we got so I didn’t need to spend too much for food - breakfast are really good and we always had an amazing food for dinner. And I’ve never seen hostel with a sauna, so that’s also something that should be highlighted. Highly recommend this place! Excellent hostel! I visited 20 different hostels till this time and this one was the best, wich I ever seen. Very nice place. Awesome hostel with a unique charm. It has many benefits such as comfortable beds, free breakfast/dinner, cool events, large common room and well equipped kitchen. The staff was super nice and helpful. I very much recommend it!